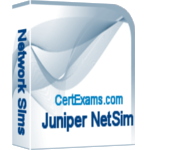 Certexams.com released Network+ Exam Sim with Netsim for Comptia Network+ exam preparation. The software contains the regular practice tests along with netsim for thorough preparation. With the recent introduction of performance based questions, the need for skill development has become important for passing the exam. The Net+ practice tests contain up to 400 questions with answers and flash card explanation for each question. The software provides both Learn mode for starters and Exam mode for advanced preparation. Other features include “full screen” mode, “night” mode, and “font” adjustment. The software provides detailed stats according to the exam objectives that help candidates put extra effort in improving the weak areas. The question database is updated from time to time to comply with the latest exam topics. The Network+® Netsim provides a virtual networking and configuration environment, wherein, you can configure the network elements such as switches, routers, servers, and access points for various parameters and test the same for proper functionality. Networking labs offered include configuring WiFi routers, wireless access points (WAP), file and user access servers, and troubleshooting tools such as trace route and ping. More labs are added from time to time keeping in step with the changes in the exam objectives and the latest technologies. Download the free demo version of the Network+ exam with labsim for free evaluation. About Network+ certification: The certification is offered by Comptia® organization on passing required exam(s). Currently, one needs to pass only one exam for attaining this certification, which is exam number N10-007. The exam requirements are updated from time to time, and one needs to check with the official website for current requirements. About Certexams.com: The website certexams.com offers network simulators such as CCNA Netsim and Juniper Netsim, and exam simulators such as Comptia A+ practice tests. A brand website of Anand Software and Training, is not associated with any other company. Disclaimer: Comptia Network+® is a trademark of Comptia® organization and duly recognized. CCNA® is a trademark of Cisco® and duly recognized. Simulationexams.com, leading practice tests provider, released ComptiaⓇ A+ Exam Sim with Labsim for A+ certification preparation. The practice tests consist of 100s of up to date questions with answers and explanations, thus providing you with exam-like questions in a timed environment. Flashcards provide domain knowledge related to the question topic. The practice tests offer all standard features like bookmarking, wrong answers review, category scoring, learn/exam modes, and details stats. The labsim is an addition to the practice exams, providing hands-on exposure to various labs. With the introduction of performance based questions by Comptia, hands-on experience has become essential for passing the exam. The labsim provides dozens of labs for attaining the practical experience. The virtual nature of labs enable users to practice without having to procure real hardware or crashing one’s own computer due to in-appropriate control panel settings. 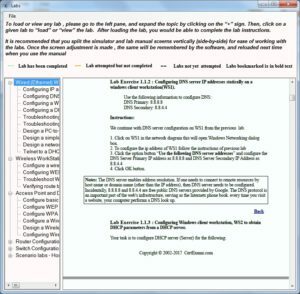 You may download the Comptia A+ Practice Exams with Labsim and install the free version (limited to fewer questions). Full version may be purchased online using program interface with immediate online activation after subscription. About Comptia A+Ⓡ Certification: For those who are new to the A+ certification, it’s a leading vendor neutral certification in the area of computer hardware and operating systems, offered by Comptia organization. The certification is divided into two constituent exams, namely A+ Essentials exam, and A+ Practical Application exam. One needs to pass both the exams to attain A+ Certification, and it’s valid for 3 years. A certified pro is expected to renew the certification by the end of 3 years. The topics covered by the certification exam include computer hardware like processors, memory devices, interfaces & connectors, computer peripherals like printers and scanners, computer operating systems (primarily Windows is covered), and troubleshooting hardware and OS problems. The certification is available via Prometric/View testing centers worldwide. About Simulationexams.com: The website, a brand site of Anand Software and Training, is engaged in providing practice tests and lab simulators for various IT certs including Comptia A+, Network+, Security+, Cisco CCENT, CCNA, Juniper JNCIA, and others. Please visit the website for more information and available practice tests. Disclaimer: Simulationexams.com is not associated or affiliated with ComptiaⓇ organization. Comptia A+Ⓡ, Comptia Network+Ⓡ. are the trademarks of ComptiaⓇ and duly acknowledged. Photo Courtesy: Brocade.com, a leading networking equipment manufacturer. As may seen in the exhibit, the VPN is configured between two routers. A site-to-site VPN is also called router-to-router VPN. The hosts on LAN are unaware of the VPN between routers V1 and V2. However, all the communication between routers V1 and V2 moves securely over OpenVPN tunnel. You typically need a NAT (Network Address Translation) to translate internal IP address 192.168.200.1 to external IP address 12.34.56.78 and vice versa (for incoming traffic). The same thing is done at router V2 also. The word “tunnel” may be a bit misleading some times. Note that there is no route and bandwidth allocated between the routers when a tunnel is formed. A VPN typically secures the communication channel but not the route or bandwidth. A VPN connections use 1) Encapsulation 2) Authentication, and 3) Data encryption. In Encapsulation, user data (i.e. TCP/IP packets) is wrapped around by using encapsulation protocol such as GRE, IPsec, L2F, PPTP, or L2TP. The encapsulated data packets are again wrapped inside carrier protocol packet, and then routed across the public network. For site-to-site VPNs, the encapsulating protocol is usually IPsec or GRE (Generic Routing Encapsulation). 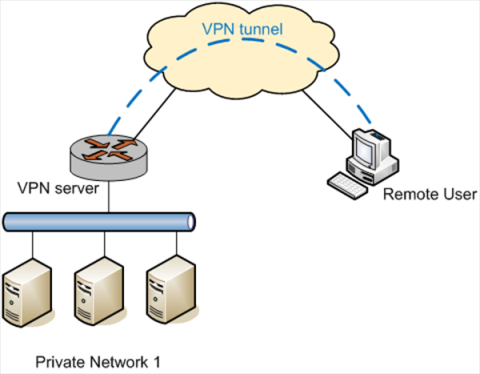 For remote-access VPNs, tunneling normally takes place using PPP (Point-to-Point Protocol). PPP tunneling will use one of PPTP, L2TP or L2F. When using site-to-site VPN, any user can access remote site from any of the computers inside the firewall (local network). For this purpose, one needs to configure AAA (Authentication, Authorization, and Accounting), so that one needs to authenticate to access any resources at the other end of the VPN tunnel to restrict user access. FHRP (First Hop Redundancy Protocol): Usually, when a subscriber connects to an ISP using Wi-Fi router, he will have single point of failure. i.e. if the router fails, the connection to the Internet fails. FHRP allows redundancy or a fail over mechanism, thus ensuring that there is no single point of failure for a subscriber to the Internet. There are several protocol defined for FHRP, popular among these are: HSRP, VRRP, and GLBP. HSRP, short for Hot Standby Router Protocol, is a Cisco proprietary protocol, and supported by most of the Cisco routers. A simple HSRP configuration is shown in the figure. In HSRP, one router acts as an Active router and the other as Standby router. There can be more than two routers in HSRP configuration, however, only one router is put in Standby state using a selection criteria. HSRP routers may be assigned “Priority” so that a network admin can choose which router has be in HSRP Active state and which has to be in Standby state. VRRP, short for Virtual Router Redundancy Protocol, is a standards based protocol. It is quite similar to HSRP in configuration and functionality. GLBP, short for Gateway Load Balancing Protocol, is slightly advanced, in the sense, that it supports load balancing by default. Otherwise, it is similar to other two redundancy protocols. CertExams.com CCNA Netsim, offers a virtual networking environment, where in, one can create a network with Cisco(R) routers, switches, and other networking elements and experiment. The software has a GUI based designer that allows drag-n-drop functionality for designing one’s own network. Several labs on HSRP, and site-to-site VPN have been added for hands-on practice. The software is intended for learning purpose with limited set of commands support. List of available CCNA labs may be viewed by going to the product page. You may download the free demo version of the software by going to the product download page. Disclaimer: CertExams.com is not associated nor affiliated with Cisco Systems, or Brocade. Cisco®, CCNA® are registered trademarks of Cisco Systems, and Brocade® is trademark of Brocade/Broadcom Limited and duly recognized. Of the above three types of FHRPs, HSRP is Cisco proprietary protocol, where as VRRP is a standards based protocols. The two protocols HSRP (short for Hot Standby Router Protocol) is very similar to VRRP (Virtual Router Redundancy Protocol), except that VRRP is based on Open standards. When using HSRP, one router assumes the function of “Active” router and the other is known as “Standby” router. The routers communicate within themselves and when the active router fails, the standby router will kick-in. 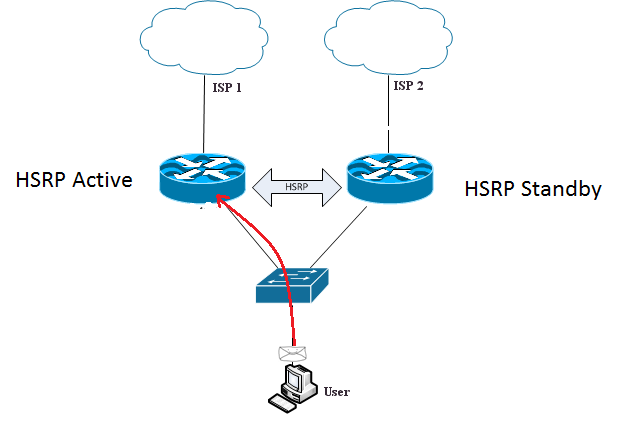 There can be more than two routers in a HSRP group. GLBP, short for Gateway Load Balancing Protocol, is a bit different from HSRP and VRRP, in the sense, GLBP offers load balancing among the redundant gateways. However, note that HSRP and VRRP too offer load balancing using distinct “groups”, but load balancing is not native to HSRP and VRRP, where as GLBP, as the name implies, offers load balancing inherently. FHRP is not to be confused with defining multiple gateway routers with a host’s network configuration file. A host computer may be defined with one or more default gateways, so that if one fails the other default gateway takes its position. In this case, the default gateways have different IP addresses, whereas in FHRP, the default gateway will have only one virtual IP address that is to be configured at the workstation. 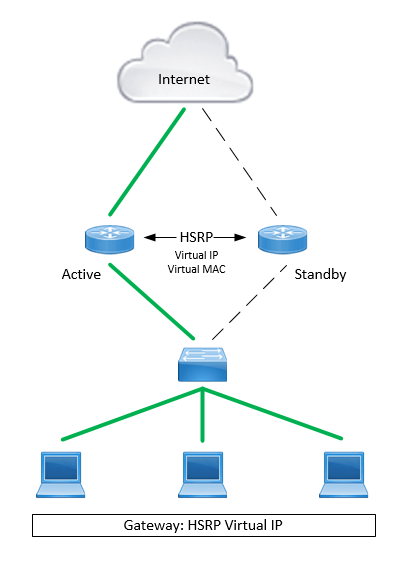 Check out the router network simulator for practicing HSRP and VRRP labs. 2. Police officials are putting in extra hours in the streets of UP – No eve-teasing and improved law and order situation in the state. 3. Installation of biometric attendance at government offices – Improved attendance. 4. Ban on use of pan masala at government offices – Improved cleanliness in government complexes. 7. Both male and female police officers to be present in every police station – Confidence in public particularly female. 8. Officials not to take any files home, should clear files only in office, during office hours – a drive towards anti corruption in the state. The above are a few to mention, and surely the state is going in the right direction. Very best to the CM and all. 2. Color coding labs so that a candidate would be able to identify labs that had been completed, under progress, and to be completed. 3. Progress indicator for a lab, which enables a user to view how much of the lab exercise has been completed and what is remaining. The labsim consists of dozens of exercises that provide handson experience in designing and configuring networks using Cisco routers and switches. Commands like ping, trace route and ipconfig are also supported.